A new Low Carb Challenge Begins on Monday, August 1st. 🙂 Join Us! I had a VERY FUN low carb taste-testing day yesterday. 🙂 Well, more like taste-eating, lol. 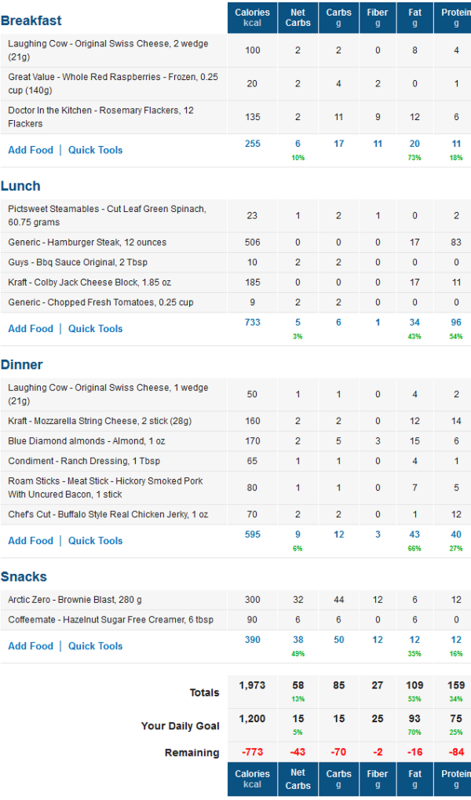 I totally blew my carb count for the day too, but all with healthy low carb foods at least. I was actually tempted to eat off plan (you know: cheat), but I just don’t have the desire for “my old favorites” after eating ketogenic consistently for SO long. So I decided to try some fun new low carb foods instead. I do still have temptations now and then. I’m pleased I didn’t end up face first in a fudge pie 😯 haha, and I discovered some new things that I really love! This all started because I was out of pecans yesterday… lol. That meant I had to get creative with breakfast. Or just eat eggs. And getting creative sounded like more fun! 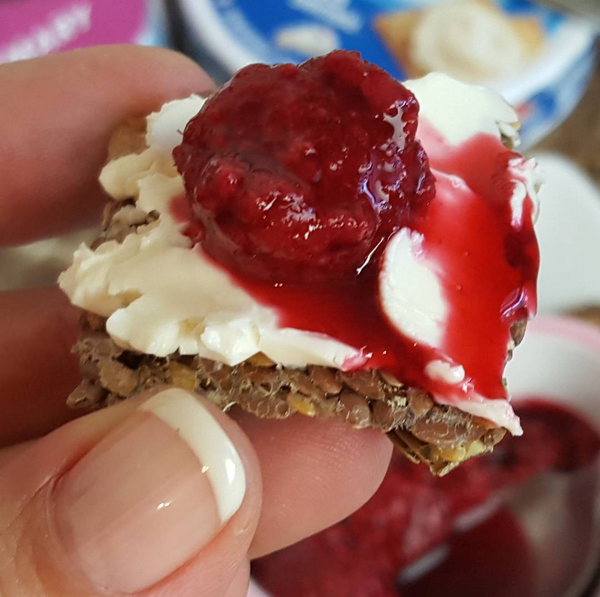 I grabbed the Flackers (flax crackers) I got in my July Keto Box, found some raspberries I already had thawed & a couple of Laughing Cow creamy swiss wedges. You can get Flackers cheapest at Netrition here. You can also see the nutrition facts there (1 carb for 8 crackers). I had 12. You can find them on Amazon too. These are really starting to grow on me. I don’t care for the Rosemary flavor that much, so I’d love to try the other flavors. These will be great for hiking, traveling, road trips, etc! They’re super low carb, if you count net carbs. For lunch I heated up a BIG plate of the Low Carb BBQ Spinach Burgers I made the day before. 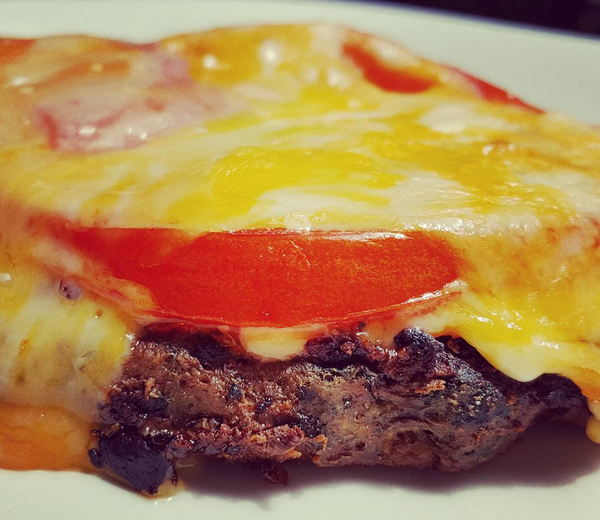 I topped it with tomato slices and colby jack cheese, and heated it up in the oven. The burger itself is FULL of spinach. My favorite thing on that plate? 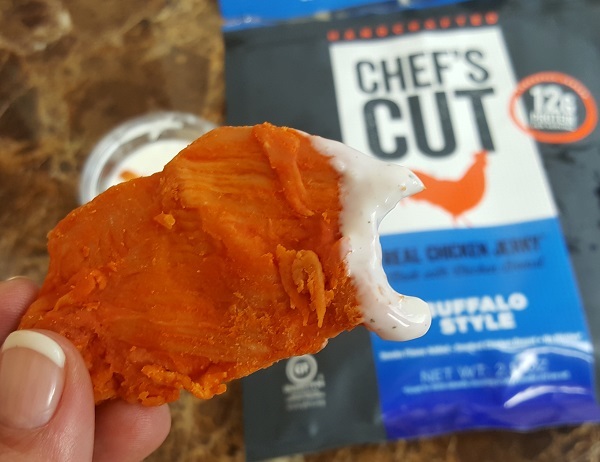 The Chef’s Cut Buffalo Style Chicken Jerky. It’s amazingly DELICIOUS!! 🙂 It’s like mild boneless wings, and dipped in ranch… it was just PERFECT. Definitely a new favorite! You can check out the details & nutrition facts here: http://amzn.to/29R9lVw. I’ll definitely be ordering that again. They’re tender, tasty, not TOO spicy. And they’re perfect for hiking, on the go, road trips/traveling, movie night, you name it! 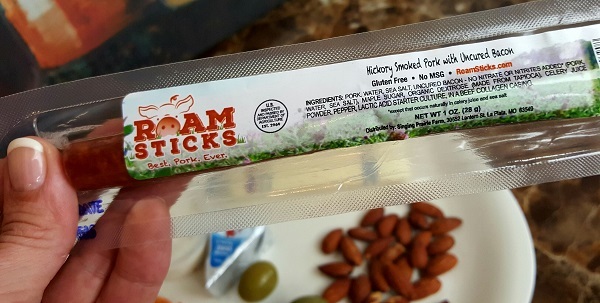 I’m not usually a fan of beef sticks, and pass on them more often than not, but the Roam Stick was actually good – and not icky greasy like others I’ve had from the gas station. It’s a pork stick by the way, not beef. Janet asked me what I thought of the Roam Sticks. They’re good – and a good low carb food: non gmo, pasture raised, no antibiotics or growth hormones, gluten free, no nitrates, no refined sugar, etc. Another great pick for my big hikes, for sure. They aren’t as tough as those “beef jerky” sticks you get at the store either. I dipped into one of the other flavors (the peanut butter chocolate pictured below) but it didn’t draw me in like the Brownie Blast. THAT flavor… is GOOD. It’s made with real sugar, but not a lot, so it doesn’t give you that blood sugar spike and woozy feeling like real ice cream – and it doesn’t give you the “tummy rumbles” like sugar free ice cream that has artificial sweeteners. A win/win! But an entire pint… does knock me out of ketosis. Duh. Obviously my macros are WAY OFF. I usually stick to 20 net carbs max, 70% fat minimum. But for a “cheat day” with all low carb products, and mostly just having fun testing out new things… it’s not so bad. 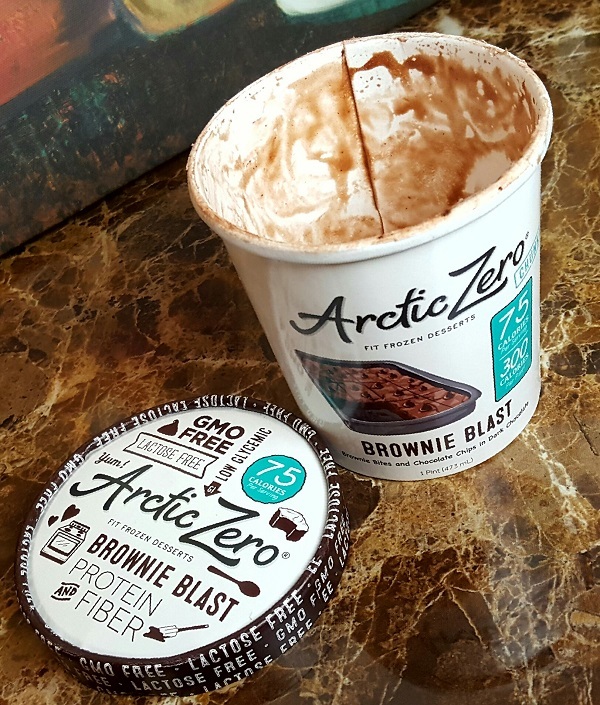 I have no control with the Brownie Blast Arctic Zero ice cream. NOTED. There was GREAT feedback on the Arctic Zero ice cream on Instagram. Lots of people chimed in with their experience! How I did not wake up weighing more this morning boggles my mind. 😛 I feel sure I knocked myself out of ketosis by eating the entire pint of Arctic Zero ice cream. The “brownie blast” flavor is DELICIOUS, but it’s 8 net carbs per 1/4 cup serving – which is 8 grams of sugar (um, x4 servings = 32 grams of sugar!). No regrets. I find “Food Regrets” and “Food Guilt” are worse for you than anything you can eat. And I feel GOOD about what I did choose to eat yesterday. The Arctic Zero is definitely a healthier choice than traditional ice cream. I’m still out of pecans. That seems dangerous, lol. It’s day 20 today. We have our final weigh-in for this mini-challenge tomorrow, on Monday morning! 🙂 That’s also when the next 90 Day Low Carb Challenge kicks off. YES, back to back lol. I would love to hear how you’ve done, and how you feel about tomorrow’s weigh in. Did you lose weight in the last 3 weeks on the mini-challenge?? I would also love to hear your thoughts on the fun stuff I tried yesterday, anything that piqued your interest, or if you’ve tried some of those yourself – what did YOU think? 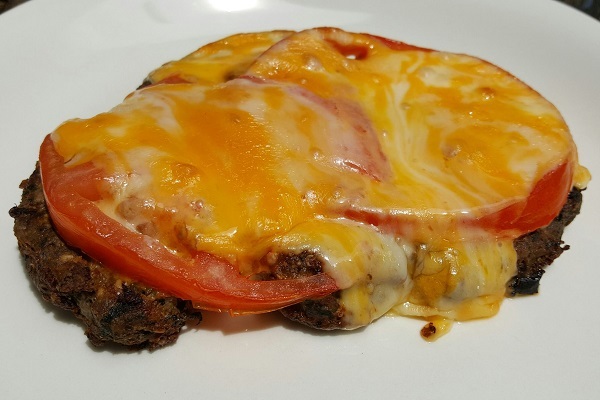 This entry was posted in Low Carb Daily Journals, Low Carb Foods. Bookmark the permalink. ← Big Beautiful BBQ Spinach Burgers! I gained a pound this morning, I knew I would since I went off plan yesterday but a pound is less than I thought I would gain and my keto strips say I’m still in ketosis this morning? I don’t think that will last. Also I haven’t done any exercise in the last two days. I need to get on my treadmill today and walk off that half potato and wine LOL. 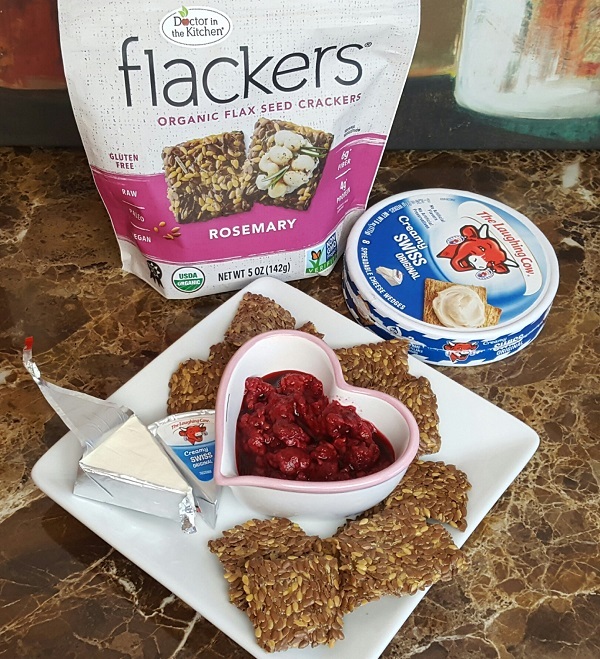 I’ve tried the Flackers and I like them, I’ve tried three flavors. Foods Alive brand Golden Flax crackers, Italian Zest, Mexican Harvest and Onion Garlic. The Italian Zest is my favorite, the Mexican Harvest were OK but the Onion Garlic had a very strong onion taste and I didn’t care for them. I’m ready to start the new 90 Day Challenge. I so wish I could find a dessert LCHF, besides the wine I’m having trouble satisfying my sweet tooth. I eat Lemon Fat Bombs and like them but you say to try to stay away from cream cheese which I love! Looking for another dessert, there are tons online, just have to find a really good one that is very low carb. I have the “serving size” all of the products use, who eats 1/4 cup of ice cream! Seriously!! It’s not right, they need to be more realistic. Have a great day Lynn and everyone. LOL I agree on the 1/2 cup! 😛 haha. Cream cheese is fine, unless you are not losing weight – and you’ve been losing weight consistently. It’s one of the things to test cutting IF you stall or aren’t losing weight. I love cream cheese & berries. 🙂 This fudge is good too, if you like peanut butter: http://www.travelinglowcarb.com/6247/low-carb-peanut-butter-fudge/ and super easy to make. Why do we need to stay away from cream cheese? Almost all of the desserts call for them??? Cream cheese is fine! It can really rack up the carbs on you if you’re not careful at 2 carbs per ounce, so you want to use it in moderation. It’s simply one of the first things to cut if you are NOT losing weight or you’re in a stall. But otherwise it’s fine and I enjoy it an ounce or two at a time, and not every day. I usually eat it with berries and almonds. 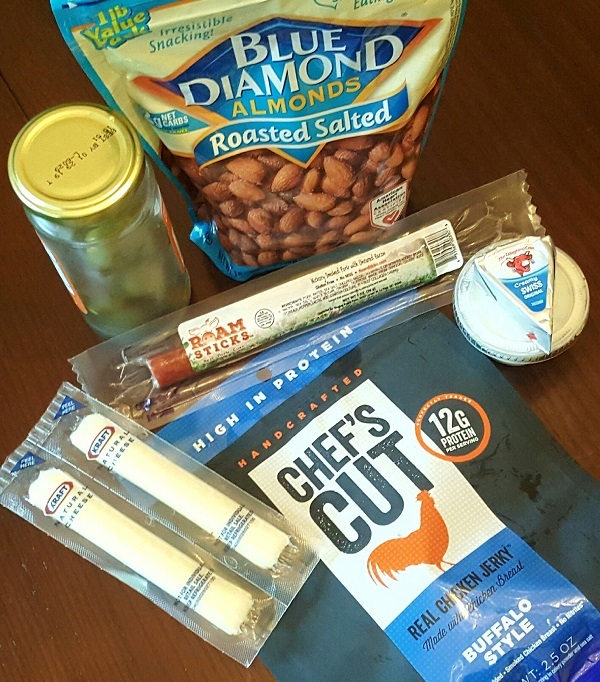 Thanks for showing us all these yummy keto snacks. i noticed that manufacturers of food products cannot seem to make products that are low fat and low carb that tastes good like the Artic Zero and halo top both have sugar. It is high in carbs but i guess it is lower than regular ice cream. I melted some sf dark chocolate chips in the microwave and addrd some pecans to it then i made little balls of it and refrigerated it. It was a very yummy chocolate treat. I found chocolate covered strawberries in the freezer section the other day. They have dark chocolate, not sugar free chocolate, but relatively low carb. I’m going to try those next. But making it with your sugar free chocolate is definitely ideal! They DO make great cookies too! I made some here: http://www.travelinglowcarb.com/1712/low-carb-cookie-recipe/ Delicious!! i am going to order some more things from netrition this coming week. That buffalo chicken jerky sounds so yummy. Question: do you prefer the Davinci brand SF syrup to Torani. I like Torani sf syrup for my coffee but i need the sf vanilla one for baking. Ive been craving an everything bagel. The carb content on the ones at the grocery store are ridiculously high and not worth it but i saw these on netrition from the great low carb bread co. Are these bagels good and are they good on the keto woe? I think it is 2 or 3 net carbs per bagel. I get these Everything Bagels: http://www.travelinglowcarb.com/5465/low-carb-bagels-at-great-low-carb-bread-company/ They are 2 net carbs each, and really good. They don’t stall me or throw me out of ketosis, but I keep it to one bagel a day max. I have tried the low carb bread but not the bagels. I like the bread and it’s one net carb per slice. It gives you that satisfaction of “real” sandwich bread when that is what you are craving. For toast need to leave on darker setting to get a bit of crisp. Also freezes well so you can keep some on hand. I tried the low carb bread and didn’t like it at all :(. And I was on the Wheat Belly diet for a long time and they don’t recommened these low carb breads. I know this is a different woe, lchf, but I still try to avoid wheat and grains because they are so bad for you as well as high in carbs. Yeah, there are actually a lot of low carb bread companies you really have to be wary of. Some are mislabeled, some have bad ingredients, some just plain taste bad (like Julian Bakery). i do like the lc bread for toast but i generally do not miss bread at all. Hey, Lynn – I’m new to this site and excited about the 90-day challenge. You said the FP group was private. When I posted in the group, it showed up on my news feed. Am I the only one who can see this, or can all my FB friends. I want to keep this private. Your newsfeed or home page on Facebook is unique to you, based on people you’ve friended and Pages you’ve liked and groups you’ve joined. Everyone logs on to Facebook and sees their own unique news feed – based on those same things. Nobody else can see posts or replies inside a Private/Closed Facebook Group (like mine) unless they are a member. If your friends or family join the group, then they CAN see posts & updates. I hope that helps. 🙂 The weigh-in’s ARE optional. You can always weigh in here on the blog with me, or just track it in your MyFitnessPal account or other app if you prefer. Thank you. I’ve been reading your blog for quite some time. I love it!! I feel like I’m taking this challenged with a bunch of friends who are experiencing the same things that I am experiencing. I’m not really techy.. FB is about as much as I do. Thank you for providing so much information and for the challenge. I love the Arctic Zero. I stay away from the Brownie Blast because I can’t control my portions if it is around. I also love the cake batter, purely chocolate and the cookie shake. They are all 35 calories per half cup. I use them in my protein shake. I don’t eat dinner at night but have a protein shake. I know that isn’t for everyone but it works great for me. I look forward to it every night and almost never get tired of having it. 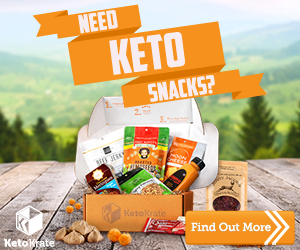 I am tempted to try the Keto Krate. Those snacks look delicious. It is hard to find everything locally and I like they do the research for you and get the best ingredients. Love reading your blog every day and the inspiration it gives me to keep on. I stay motivated for the health benefits more than anything. Eating this way is the only thing that keeps my blood lipid profile good as well as keeps me pain free. Thanks for all you do! I think you’ll really enjoy the Keto Krate. I do. 🙂 I love the concept, because just having new things to try, and new things coming to look forward to, keeps me from getting antsy or bored. :) You can cancel anytime, so try it out and see what you think! My local Big Lots has Flackers @ $3/5 oz. box. I bought two boxes–Rosemary, and Dill. They also had Cinnamon with Dates or Raisins or another fruit. Can’t remember what it was. I was going to buy that flavor until I noticed there were 16 carbs! Tried the Rosemary (1 net carb/5) in the car on the way home. The jury is still out on the taste until I try them with cheese or another topping. The texture is nice and very crisp, but the flax seeds surely got stuck in my teeth! lol Cindi, yes. I keep dental floss with me in my bag everywhere I go. Pecans! haha, they get in my teeth too. I’ve had so much dental work from a head trauma I had in 1994 that I have to floss 3-4x a day. Well anytime I eat. I’m not a fan of Rosemary, in general I mean, but I do like the Flackers. I can’t wait to try other flavors! Love that! I was wishing I had some in the car. Good thing I was headed home! Just checked Flackers’ website. The flavor I couldn’t remember is Cinnamon & Currants. The price per 5 oz. box is $5.99 plus shipping. My 5 oz. box was $3 at Big Lots and expiration date is 10/16. Not a bad bargain! We have a Big Lots here. I’ll have to browse through. 🙂 Thanks! Anything with dates raisens, currants or any dried fruits is going to be high carb. Another reason to read labels. my father taught me how to read labels long ago…he was ahead of his time. My poor mom couldn’t buy any food with crazy ingredients in it like boxed cake mixes etc. She made everything from scratch. My father was very health conscience. Oh man I would’ve ate the whole pint of that ice cream too! Lol. I’ll have to see if my walmart carries it cause that would be a nice treat to have once in a while. I haven’t posted in a few days but no fear! I’ve stayed on plan and pretty much have had the same things I always have lol. I’ve lost another 2 pounds for a total of 7 this mini challenge…yay! I’m super excited about the next 90 day challenge. And yes, no guilt here, I’ve missed my “pint night” and it was SO good. And didn’t make me sick and woozy like regular ice cream – or give me “tummy rumbles” like sugar free ice cream. Win/Win – except for knocking me out of ketosis, lol. Your meals sound SO good. I have errands to run tomorrow so I’m going to eat out and enjoy some nice low carb meals myself. Thanks so much! I’m really trying to do my best with this because I’ve quit and restarted so many times it’s ridiculous. I forgot to mention that I made your low carb cookies and instead of blueberries I added 2 Russell Stover chocolate truffles. It’s 1 net carb per 3 pieces so it didn’t raise the carb count at all. They were pretty good I must say. Your cookies sound fabulous!! I have ingredients to make cookies… I should do that this week. YUM! I love your meals! 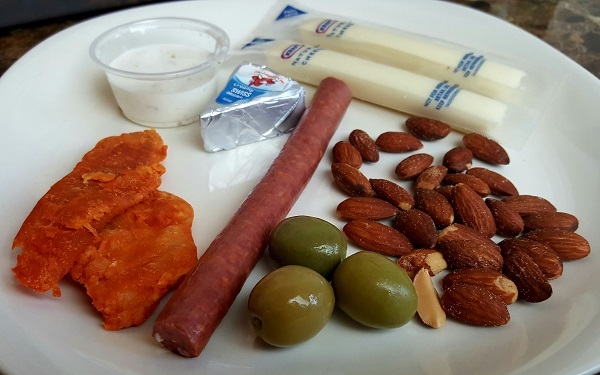 Olives, nuts and a little cheese are a great work travel lunch. I am looking to expand my lunch meals as I head back to work. I think summer was harder on my new way of life. I plan to try pork skins!! Not something I ever thought I would eat, I am gonna put a little equal and cinnamon and see what it taste like. I don’t eat pork skins often. But when I do – I have a bag out on the counter right now, lol – I put them on foil and roll up the edges, add butter and cinnamon and some sugar free vanilla syrup (a little sweetener of any kind will do) and shake them around in the oven like that till their coated.